Detail of Astrape (Lightning) from a painting depicting the tale of Leda and the Swan. 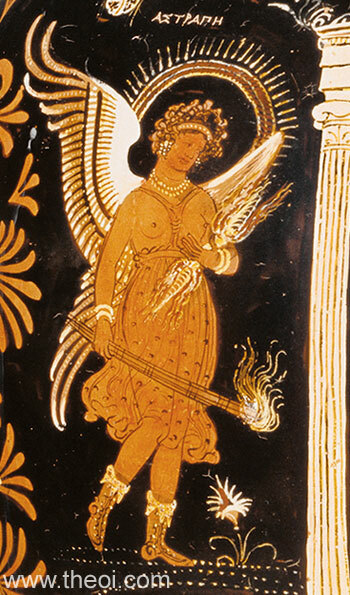 Astrape, lightning personified, is depicted as a winged goddess standing beside the throne of Zeus. She is crowned with a shining aureole and holds a flaming torch and lightning-bolt in her hands. She was perhaps identified with Astraea-Dike, the goddess of justice and of the constellation Virgo, for her attributes resemble those of a star-god (cf. image T19.12) and the lightning-bolt was an instrument of justice.